I detest the food Nazis. I eat/drink copious amounts of ‘so-called’ offending foods as a form of private protest. ***fist raised*** The junk science the food Nazis try to spoon-feed the American public….well, it’s purely annoying and faddish. 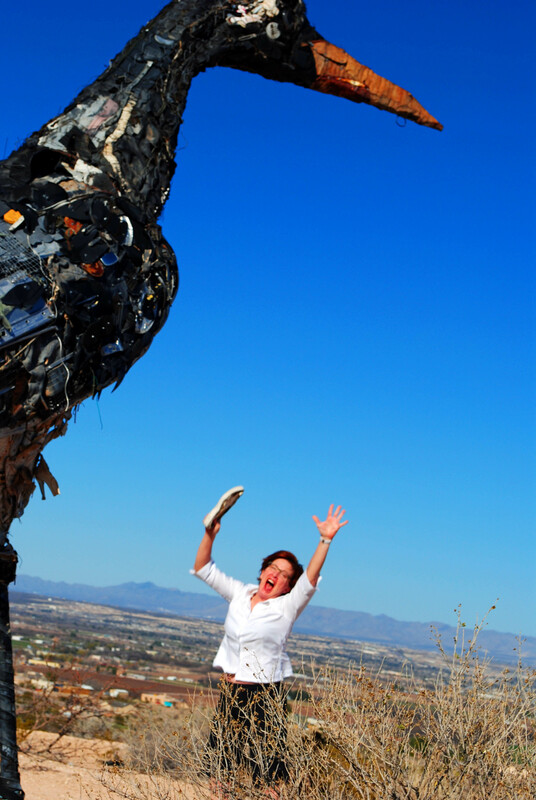 THEN-remember the evils of coffee? Coffee was gonna kill you, raise your blood pressure and clog your arteries sure enough….better stop drinking it or wind up six feet under! NOW-coffee is a wonder drink that stimulates the brain and wards off Alzheimers. It reduces your sudoku completion time! Coffee applied directly to the skin can reduce wrinkles and banish cellulite forever. Owning a Keuring is now an acceptable form of health insurance. Hey Texan….how’s the construction of the coffee endless pool coming along?? Movie popcorn, beef, eggs and milk have all found themselves in the food-Nazi’s crosshairs. Another food sounding the alarm for the food police?…...bacon. THEN-bacon is fatty and the animal fat will clog your arteries and your heart will explode. It contains harmful nitrates which cause crazy cancers in white lab rats. Run for the hills people!! Only an insane person with a salted-pork death wish would touch the stuff. I adore fried, salty, nitrate-laden, crispy pork belly. I never quit eating it…probably have it 2-3 mornings a week with a nice piece of whole wheat toast. But law-zee, people….have you noticed the current trend?! No longer is bacon a compliment to fried eggs or pancakes completing the perfect breakfast. It’s not just another topping to pile on our mega-triple-bacon cheeseburger. We are so highly evolved, bacon is no longer the perfect compliment to tasty baked beans. NOW-crispy, fried pork is the ingredient du jour in our ice cream! 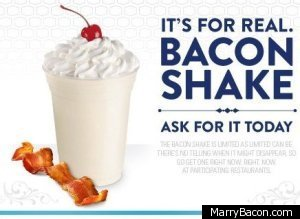 It tastes even better when the shake is made with yummy, fake-bacon flavoring. Mmmm-mmm-mm! 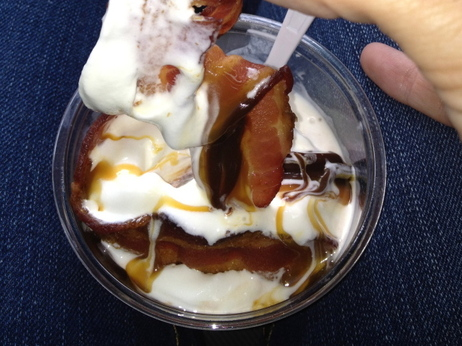 A bacon-flavored shake is precisely what I’m cravin’. How ’bout you?? OK, chicken-wingers. This is wrong on so many levels, I don’t know where to start. What happened to good’ ole sprinkles, fruit, chocolate/caramel, nuts, marshmallows…..even freakin’ gummy bears? 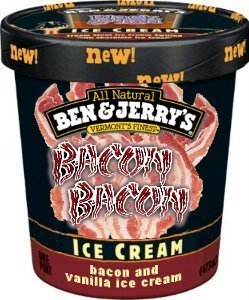 I scream, ‘Nothing good can come of this food combination’. It’s the baconization of America! Food purity love to all.